Uttar Pradesh Subordinate Services Selection Commission, Lucknow is going to fill vacancies of Chakbandi Lekhpal (Accountant). For that, it had invited applications to fill approx. 3000 vacancies back in April 2015. The selection is to be done on the basis of written exam and interview. Uttar Pradesh (UP) Chakbandi Lekhpal exam is scheduled to be held on 20 December 2015. The written exam is to organized for finding eligible candidates for these posts as a part of the selection process. A large number of candidates have applied for this exam and are going to appear in the written test. The test will be held in 6 districts of Uttar Pradesh. Candidates can download UPSSSC Lekhpal Exam Admit card 2015 from the direct link given below. It is mandatory to bring lekhpal admit card at the exam hall at the time of examination. No candidate will be allowed to enter the venue without it. The written examination will be held on 20 Dec 2015. Release date: UPSSSC Chakbandi Lekhpal admit card had been released on 15 December 2015. UPSSSC Chakbandi Lekhpal Exam date: UPSSSC Chakbandi lekhpal exam is going to be held on 20 December 2015. All the posts will be filled district-wise. The written test will be an objective type exam which will be conducted offline using pen and paper mode. The question paper consist of 80 marks. Questions will be asked from General Knowledge, Quantitative Aptitude, Hindi & Rural Development subjects. Those who qualify the written exam, will have to appear for interview. While written exam carry 80 marks, interview will be of 20 marks. Final Selection will be done on the basis of marks obtained in written exam and interview. Selected candidates would be posted in Pay Scale of 5200-20200 GP 2000. The Chakbandi Lekhpal admit card 2015 can be downloaded from above link now. 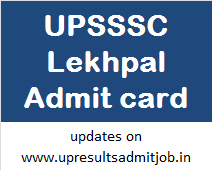 Click on the link of UPSSSC Chakbandi Lekhpal Admit card 2015. Enter your details like application no. / user name and password / date of birth and click on login / submit. Your admit card of UP Lekhpal Re-Exam will be shown to you. Take a printout of it. Check out the important details like exam date, roll number, venue, date and time. Remember to bring it with a photo id proof at the time of exam at the centre.